Arizona Republican Gov. 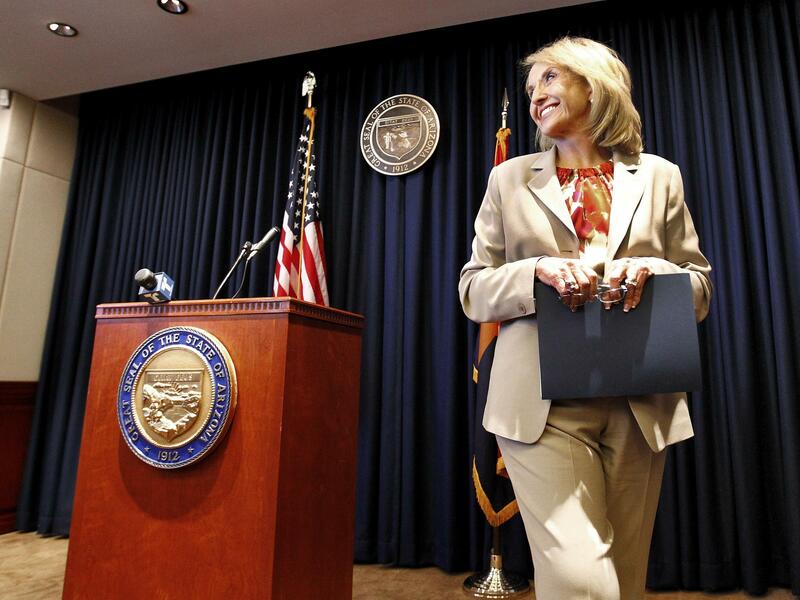 Jan Brewer leaves a podium at the state Capitol in Phoenix after responding to President Obama's immigration speech on June 15. Brewer said the speech represented a "pre-emptive strike" aimed at what then was an upcoming Supreme Court ruling on Arizona's immigration law. In so doing, the court affirmed the federal government's supremacy on issues of immigration. The justices' majority opinion said that Arizona's issues with illegal immigrants aside, "the State may not pursue policies that undermine federal law." "While this isn't necessarily the death knell for state immigration laws, it's definitely a speed bump," says Steve Vladeck, a professor of law at American University in Washington, D.C.
"I think there's going to be a lot of litigation over this in the next few years, but essentially the court has said that when it comes to immigration law, the states can supplement it to a certain extent, but it's not up to them to supplant it," he said. President Obama, in a statement a few hours after the ruling, said the decision reaffirmed the need for comprehensive immigration reform. "A patchwork of state laws is not a solution to our broken immigration system — it's part of the problem," the president said, adding that he remained concerned about the provision upheld in the Arizona law. "Going forward, we must ensure that Arizona law enforcement officials do not enforce this law in a manner that undermines the civil rights of Americans, as the Court's decision recognizes." The Obama administration, which sued to block the Arizona law after it was enacted in 2010, should be happy with the ruling, says Charles Foster, a Houston-based immigration attorney and senior policy adviser to former President George W. Bush, who also advised then-candidate Obama. The Obama White House "was criticized for taking the states to court and challenging the constitutionality of these laws. This steals the thunder from a lot of his critics who said he was unfairly going after the states," Foster says. Parts of similar laws in five other states — Alabama, Georgia, Indiana, South Carolina and Utah — have been on hold pending the Supreme Court decision. All but Indiana have provisions allowing police to check on the immigration status of anyone being detained. That concerns Cecilia Wang of the American Civil Liberties Union's Immigrants' Rights Project. "This is definitely a mixed ruling from our perspective," says Wang. "On the one hand, this was a strong rebuke to the other side," she says. "On the other hand, Arizona police are now going to be out on the streets, where they will be racially profiling." The ACLU's challenge to that provision was filed two years ago in the U.S. District Court in Phoenix. It claims the Arizona law violates guarantees of equal protection, due process and against unreasonable searches and seizures. The Federation for American Immigration Reform, or FAIR, one of the organizations at the forefront of state laws to crack down on immigration, said the decision to uphold the provision is an important victory for the people of Arizona. "Even if the Obama administration refuses to enforce most immigration laws, states have the power to deter and discourage illegal aliens from settling or remaining within their jurisdictions," FAIR President Dan Stein said in a statement. "It is now up to Congress to hold the Obama administration accountable for carrying out the nation's immigration laws in a manner that protects the interests of the American people in all 50 states." Other aspects of state immigration laws may be rescinded by the Supreme Court's decision. In Alabama, for example, the 11th Circuit Court of Appeals has been waiting for the Supreme Court decision before resolving a provision in that state's law that would make it illegal to knowingly enter into a contract with an illegal alien. State Sen. Scott Beason, who sponsored the Alabama law, defends it against critics who make the racial profiling charge. "If someone's driving without an ID, doesn't have a driver's license, cannot be pulled up on the onboard computers that are in our law enforcement vehicles, someone needs to figure out who this person is — not just as an illegal immigration question, but as a security question," he says. Michael Hethmon, general counsel for the Immigration Reform Law Institute, which helped craft many of the state laws, says his organization is also girding for challenges from industries such as agriculture that use migrant labor. "These industries would change if their labor costs were boosted up to a sustainable, livable level," he says. "This is not a major economic crisis — it's an outcry from reactionaries who simply don't think they can compete in a modern 21st century economy," Hethmon says. "And it may be that ultimately, they can't." When South Carolina passed its immigration law in 2010, it quietly exempted employers of domestic and agricultural workers from having to verify their immigration status — a not-so-subtle nod to the continued need for migrant workers, critics say. In Mississippi, similar legislation died in committee after the state's Chamber of Commerce opposed it. Craig Regelbrugge, national co-chairman of the Agriculture Coalition for Immigration Reform, says his organization has been pressing for a wholesale overhaul at the federal level to clear up the uncertainty that has driven away many migrant farm workers. In Georgia alone, a shortage of farmhands resulted in an estimated $75 million last year as unharvested crops rotted in the field, according to a University of Georgia study. "These migrant workers are afraid of being profiled," Regelbrugge says. He says currently, the only legal avenue to hire migrant workers, the seasonal guest worker program, is "a bureaucratic nightmare on a good day" and that repeated attempts to recruit legal Americans as farm laborers have failed. "The work is out in the weather. It's in conditions that a lot of folks, if given a chance, are going to opt to stand in air conditioning in Wal-Mart or McDonald's," Regelbrugge says. "And much of it is seasonal work, which basically means you are intermittently employed. Some of it is even migrant, which means you work, you pick up stakes, you work some more and then move again." "That is not a lifestyle choice that Americans are going to make," he says.